All pictures are from the archives of Ray DeLea unless otherwise noted. From the summit of New Army Pass looking southeast. Below you can see (from foreground to background) High Lake, Long Lake, Upper South Fork Lake, and Lower South Fork Lake. This is such a spectacular view from New Army Pass! It has always been one of my favorites. This is a picture of yours truly, circa 1968, on one of the many pack trips which MWPT took over this pass. This is also a memorable pass for me because this was the pass which I had my one an only pack train wreck about 100 feet from the summit during a Trail Riders of the Wilderness trip in 1969. My last mule, Wendy, set back so hard she pulled herself and the three mules in front of her right off of the trail, if I hadn't managed to jumped off my horse and cut the lead rope going to my first mule, my horse, lead mule and I would have gone over as well. It wasn't a pretty sight for the guests, who were about 1/4 mile below on the other half of the trail switchback, to see four mules rolling down the mountain. Another terror that no one but me saw was what happened when I cut the rope attached to my lead mule. Our Paiute Indian boss (one of the best anyone could have), Tommy Jefferson, always insisted that we have a pocket knife with just one or two long blades on it; and, that we keep it razor sharp. This was one of the items, if you had any sense, you always complied with; and, my knife was VERY sharp! Well, when I touched that knife to the rope attached to my lead mule (Bart) it snapped like tightly strung barbed wire and drew the knife blade completely into Bart's shoulder. I yanked the blade out as quickly as I could but I still ended up with blood all over me as well as Bart. We both healed up in record time;but, I have to tell you, the sight of blood is not a good thing for me. This packer once fainted when he took his parent's cat to the vet for a shot. When the vet stuck that seemingly Paul Bunyan size needle into the cat it did me in. Thankfully no one was injured in the wreck and the mules came out OK. The only thing that was shattered was my nerves and a bit of my beginning reputation as a packer. It took myself and several other of the packers about 40 minutes to clean up the mess, repack the mules, and loose herd them over the pass. It taught me a lesson I never forgot either, you could never watch your mules too much! I didn't intend on giving the Trail Riders this type of Kodak moment, but I'm sure one of the 30 or so guests captured it on film! Looking west from the Pacific Crest Trail you can see the Siberian Outpost sweeping through the middle of the picture (a sprinkling of meadow in an otherwise sandy expanse). 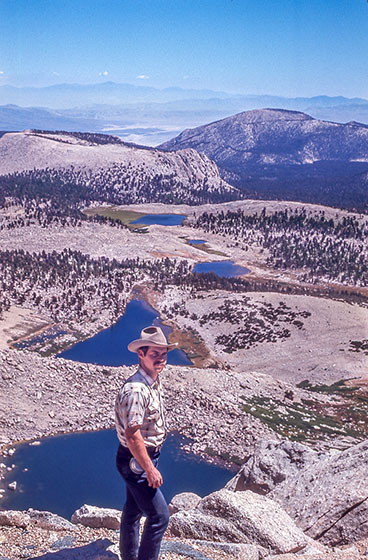 The Boreal Plateau sets highin the right background and the peaks surrounding Rock Basin Lakes in the left background. 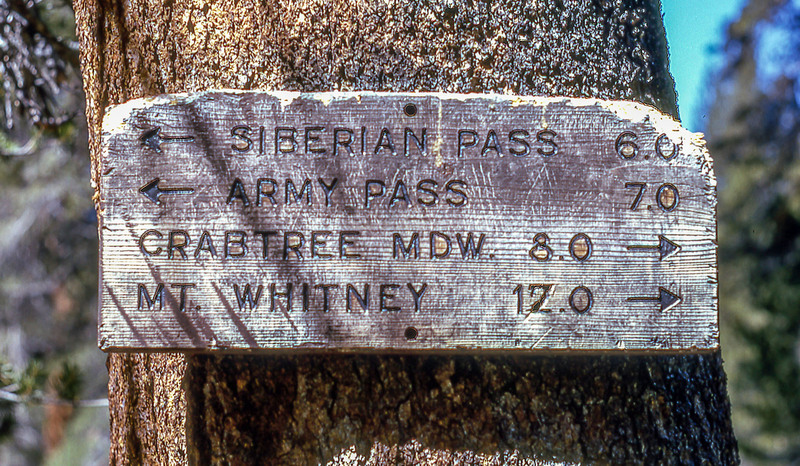 We often packed down through or across the Siberian Outpost, coming from Big Whitney Meadows over Siberian Pass, to Middle and Upper Rock Creek. Seldom if ever were camp sites selected here. There usually was never enough water to support anything other than the sparse meadow that existed. 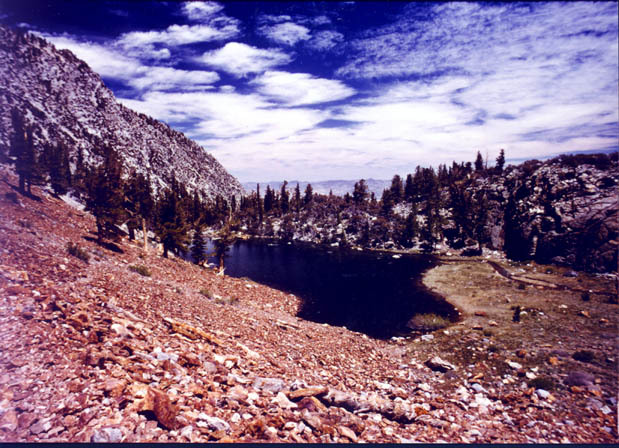 Following the middle canyon near the center of the outpost you can pack over a small pass into Rocky Basin Lakes; or, continue crosscountry up onto the Boreal Plateau to Funston Lake. 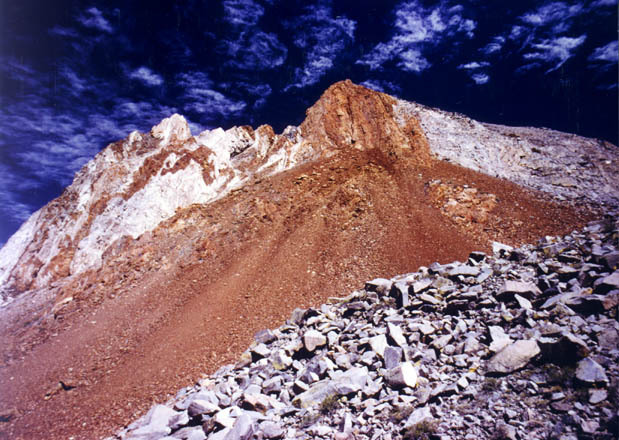 If one continues off to the immediate right they would drop into Upper Rock Creek with access to the Miter Basin, Sky Blue Lake and Army Pass. Continuing on down the outpost, the trail will eventually lead you to middle and lower Rock Creek. The picture to the left (with the small lake) was taken from a pass on an arm of the Siberian Outpost which drops you right into Rocky Basin Lakes. In the background left of the picture, covered in clouds, is Mt. Langley. I climbed this once, by myself (never recommended of course to anyone) and was trapped on the summit by an electrical storm. I managed to find a big enough hole amongst the boulders on the the summit to scurry into and wait the storm out for 40 minutes or so. It was rather neat on the summit. The old summit ledger was still there and contained such names as Clarence King, Norman Clyde and Walter Starr. These days those ledgers are locked up in Sierra Club archives because vandals began taking the originals. Even the tops of mountains aren't safe from vandals anymore. It is so sad what we have become as a people that even the tops of the mountains, and the efforts it took to get there, aren't sacred. This is another one of those locations which words fail to adequately capture. 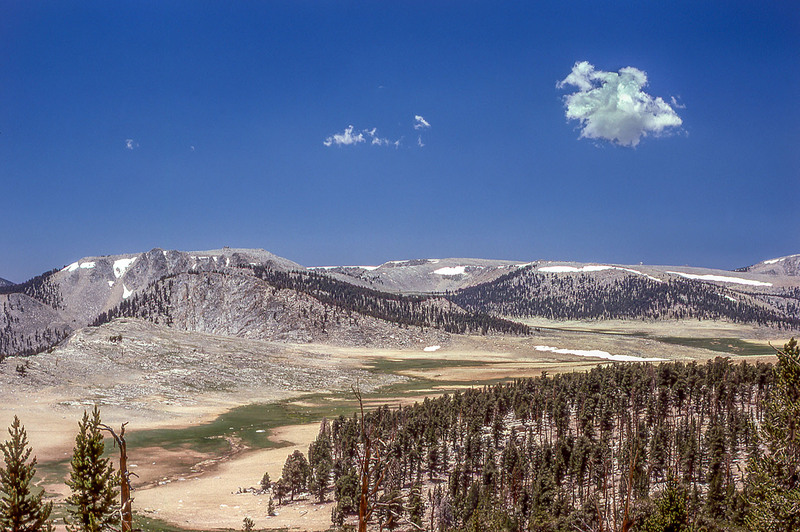 Part of the Wright Lakes complex, this meadow virtually starts at the lakes and follows Wright Creek until the creek drops off of the glacial plateau in the Kern River gorge, approximately one mile beyond the meadow. Off in the west are Red and Black Kaweah on the Great Western Divide and Colby Pass. Although I never packed over Colby Pass, I did hike over it and I can see why it's easy to have a wreck there. If you don't loose herd your stock and keep an eagle's eye at every switchback along the way, you're looking for trouble. Some of our packers found this out the hard way during the summer of 1966. Dead mules and a horrible mess were the reports which eventually found there way back to the Whitney Portal Store where Ed Brown, my brother Tom, and myself were "doing time" that summer. 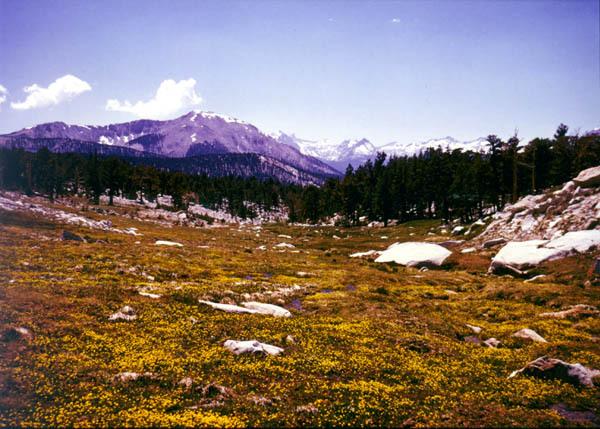 This meadow saw many a wrangle from me since we always camped at Wright Lakes with the Trail Riders of the Wilderness and with the Sierra Club (when they were in this part of the Sierra). Because the meadow was soooo long, it invariably made for long wrangles; and, because the stock never seemed to always stay together there was ample opportunity for everyone to get in plenty of "frequent packer walking miles" in their riding boots. Although I never packed over Sawmill Pass, only hiked, it is one of the most picturesquely overlooked trails in the Eastern Sierra. The trail to Sawmill Pass and Woods Lake is still in great condition; but be forewarned, it is ruthlessly steep with no water for the first seven miles. 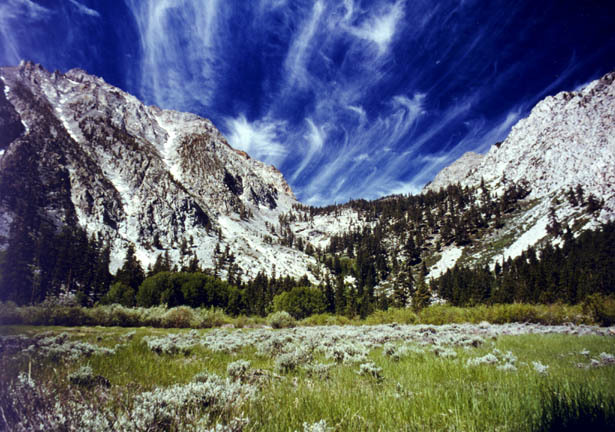 The views of Owens Valley and the trail climb are memorable beyond belief. Woods Lake can be reached via two trail heads - the roadend at the Division Creek Powerhouse and and the roadend at Harry Birch Springs. Either trailhead has you starting from the desert floor of Owens Valley. This can be particularly brutal considering that the temperature on the desert floor is often in the 90s early in the morning. When I decided to make this "trail adventure," I hiked under a full full moon, at about 9:00 P.M. from old U.S. 395 to Harry Birch Springs. The next morning I was up bright and early at 5:00 A.M. heading up the face of the mountain. I only stopped for a brief moment at Sawmill Creek to "wake up" and get some much needed water since the next water was seven miles away. This was a memorable trip in two ways. Firstly, it was the only trip on which I ever hiked alone; and, while that may be some folk's "bag of tea," it definitely turned out not to be mine! It was quite difficult to laugh or tell a joke to a chipmunk and get any sort of response. I didn't see another person on the trail the entire weekend. The only other people even remotely close were some gun totin' shootin' people on the north end of Sawmill Lake. Secondly, it was the first trip on which I literally "collapsed" on the trail. Remember I told you how steep this trail was. About the time I reached the sawmill (some 6 miles up the trail) all of the sudden my legs just gave out underneath me. If you don't think that was a ridiculous sight! There I was lying face down on the trail covered by my pack and unable to move. I managed to "roll" myself off of the trail just in case any stock came along. It took me about 5 minutes to recover from that incident so I could just sit up and another 20 minutes before I could actually start hiking again. I can't begin to tell you how many trail signs I packed by over the years. I certainly wish I had taken more pictures of them. They are so seemingly insignificant when you go by some of the same ones over and over again; but, how can you forget them. With all of the havoc the vandals are playing in the backcountry these days I am surprised they haven't done something with the trail signs! 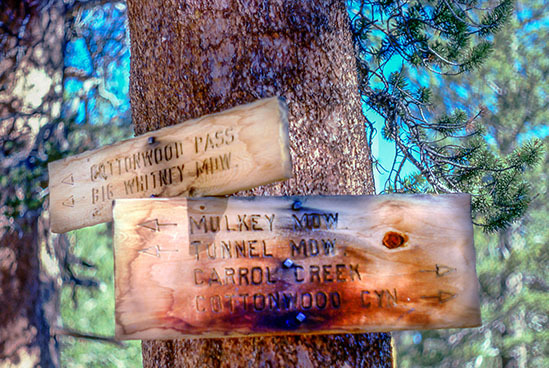 Hey, if they'll steal aregister at the top of a mountain, what is a trail sign? I can still picture many of those backcountry signs like those leading over Bishop Pass into Dusy Basin, or over Avalanche Pass into Cloud Canyon and Colby Pass, or at Junction Meadow on the Kern River leading over Colby, Forester and Shepherd Passes; and, to the north those leading over Snow Summit into Kerrick Meadows and onto Benson Lake, or over Buckeye Pass into Paiute Creek and onto Tilden Lake? Whether in the back country or at the trailhead they represent icons of places we've been to, are passing by, or are going to. Like names chiseled into granite, they are signposts to a time when we can unload the mules, set-up packer's camp, chow down at the camp commissary or find a secluded place in one of the streams, get buck naked, and take one of the coldest baths you're liable to ever take! I still recall the time we were camped at upper Rock Creek, just westof New Army Pass, in early June. With snow still everywhere and none of the packers having taken a bath in about two days, things were getting pretty foul in packer's camp, it was time for a dip. I grabbed my toiletries and a fresh change of clothes and headed for the creek. There were snow banks to the right of me and snow banks to the left of me. When I jumped into that creek I nearly died! The sheer sight of the height of my goose bumps drove away the rest of the packers. Even my old trail mate, Norman Jefferson, failed to take the plunge. It was another two days before anyone else ventured into those streams. But what the heck, that is what it was all about! Sometimes a cold shivering, clean packer is just what the commissary girls had in mind!